Golf is a repetitive physical activity that puts a lot of strain on the body. Each year, almost a fifth of all golfers will suffer some kind of injury. Here, we consider five common golf injuries and look at what can be done to prevent them. It’s estimated that 20% of all golf injuries occur in the lower back. The repetitive action and twisting of the golf swing can cause injury to the muscles, ligaments, discs and facet joints of the spine. The majority of back injuries are suffered by older players and these are often caused by a slipped or partially herniated disc, which will cause pain in any movement, particularly a golf swing. Prevention: The key to preventing back injury is to maintain good core strength and stability. By keeping the core muscles strong, the pressure is taken off the back, which will help stop injury occurring. There are a variety of exercises which can improve a golfer’s core strength, including planks, slow sit-ups and hip cross-overs. Seek guidance from an expert physio on an exercise programme to increase core strength. 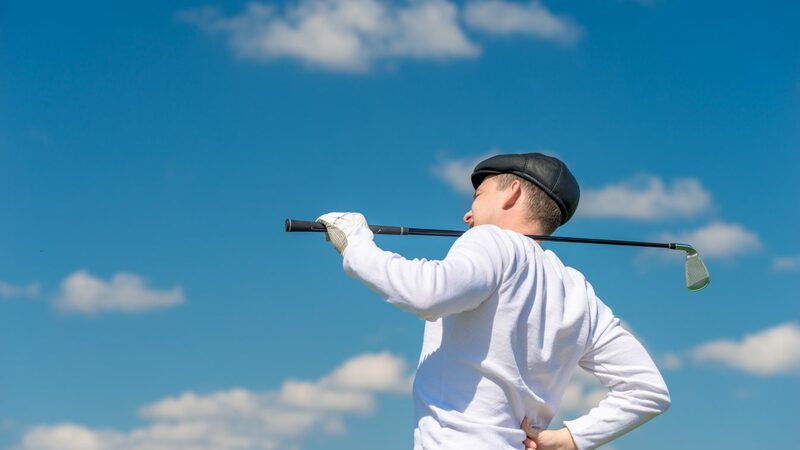 Golfer’s Elbow causes pain and inflammation to the tendons that connect the forearm to the elbow. The pain centres on the bony bump on the inside of the elbow and into the forearm. Golfer’s elbow is usually caused by overusing the forearm muscles that help you grip, rotate your arm, and flex your wrist. Like tennis elbow, golfer’s elbow is a form of tendinitis. The difference is that tennis elbow is caused by damage to tendons on the outside of the elbow, while golfer’s elbow is caused by damage to tendons on the inside. Prevention: Gripping too strongly or incorrectly can exacerbate golfer’s elbow, so you should check with a professional that your grip position and pressure is correct. Stretch your arms before playing, particularly if you haven’t played recently. Also consider the use of an elbow compression strap. This works by preventing the wrist’s extensor muscles from contracting fully, thereby reducing the strain on the tendons at the elbow. Injuries to the rotator cuff, causing pain in the shoulder and upper arm, can be sustained quite easily on course. An overly aggressive swing, striking something firm in the ground, taking a deep divot or simply over-playing can all cause shoulder injuries. Golfers can suffer tendinitis, bursitis or tears in the rotator cuff because of the repetitive action of the golf swing. Prevention: Stretching and a good warm-up routine is important in preventing shoulder injury. Poor technique can also lead to a swing that damages the shoulder. If you don’t turn the body away correctly and fully on the backswing, this could place undue pressure on your leading shoulder. Also, don’t do anything stupid. If your ball is lodged between two tree roots, take a penalty drop and accept a shot has gone. It’s preferable to a torn rotator cuff! Serious wrist injuries are common among golfers and they will generally occur at the moment of impact of the club with the ball (or ground). Wrist action is a critical part of the swing, but the repetitive motions of golf and the high speed of the swing place a great strain on the wrist. Repetitive stress injury is also common, owing to the action of the golf swing. The most common golf-related wrist injury is tendonitis: swelling of the tendons responsible for wrist movement. Prevention: Again, stretching and strength conditioning programmes are important. Wearing strapping on the wrist can protect and limit the effects of repetitive impact and, as with the shoulder, common sense should prevail. If the ball is buried in deep rough, don’t attack it like you’re trying to kill a snake. Sometimes, discretion is the better part of valour. This might seem an obvious one, but your skin is your body’s largest organ and the most vulnerable part of you while out on the golf course for four hours at a time. Repeated exposure to the sun can lead to skin damage and even skin cancer, so you must take prevention seriously. Prevention: Always wear high SPF sun cream when golfing. Even if it’s not a blisteringly hot and sunny day, the harmful rays are still there! Wear clothing that protects against the sun – and, of course, a hat. In summer, avoid playing in the middle of the day. Hopefully you found these tips useful. If you’re a senior golfer, check out our training tips to improve your overall performance!